Low-income customers can receive FREE energy efficiency upgrades to improve comfort and reduce energy consumption in an electrically heated home. The measures improve energy efficiency, health, safety and air quality for qualifying customers. 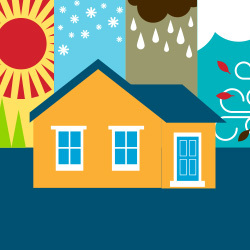 Homeowners and renters will learn what they can do to save the most energy and stay comfortable and safe in their homes. Idaho Power provides two no-cost programs to Idaho residents based on income guidelines below. Qualifying homes must be heated with electricity provided by Idaho Power. Qualifying homes include single-family homes, manufactured homes, mobile homes and apartments. Rental homes need landlord permission for possible participation. Household income must fall within current federal poverty guidelines listed in Income Qualifications. Idaho Power provides a no-cost program to Oregon residents based on income guidelines below. Qualifying homes include single-family homes, manufactured homes, mobile homes and apartments. Rental homes need landlord permission and possible participation.